The Single Girl′s To-Do List gives Rachel the perfect heartbreak cure - and proves love is out there if you′re willing to take a chance. Rachel’s character captured my heart. I instantly related to her and rooted for her every step of the way while she mended her broken heart. Not a typical road to recovery consisting of ice cream, tears and horrific renditions of ‘All by Myself’, the ‘Single Girl’s To-Do List’, concocted by her two best friends, helped Rachel rediscover who she is, how much she is capable of and opened her eyes to all that she wants to do. Not to mention provided much amusement and many laughs along the way. Rachel’s best friends, Emelie and Matthew were constant sources of wisdom and giggles and as much as they all might have all bickered, their love for each other came shining through. I loved the throw back to classic chick lit with the gay best friend and loved their characters just as much as Rachel’s. The love interests were laughable and loveable and sometimes even surprising, which I enjoyed. The connection to the I Heart series (no spoilers!) was fun and the ending had me grinning from ear to ear. I will definitely be rereading this book at some point and that’s not something I say lightly given time constraints and the continuous stack of books beside my bed demanding to be read. Thank you to HarperCollins Canada for the review copy! All opinions are our own. Hiya! I'm following you on your site through google connect, google+ and twitter. Love your review of this book - sounds like such a fun read! Great giveaway!! I have been hearing about this... your review...so simple and to the point!! Buy this book..Now!! OK, unless of course I win it...which would be Fabulous!! Thanks for the opportunity!! Here in the UK we have a different cover. Sounds like a great book. 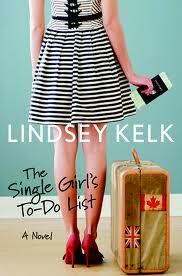 I love Lindsey Kelk!